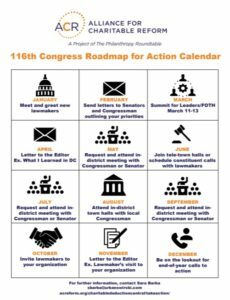 One of the most popular sessions at the 2017 ACR Summit for Leaders was the presentation of our Roadmap for Action, which was a 12-month action plan to engage with lawmakers in your community and members of the 115th Congress. At last week’s ACR Leadership Breakfast, we unveiled the 2019 Roadmap for Action for the 116th Congress. The latest version can be downloaded by clicking the image below. Over 100 freshman lawmakers were sworn in this session, which brings new opportunity for the charitable sector to educate policymakers on the importance of philanthropic freedom and, hopefully, gain some new champions for our causes. Many Americans may not know how simple it can be to reach lawmakers and make them aware of the issues our sector faces. The Roadmap for Action makes it even simpler by providing a step-by-step guide. You can also visit our Take Action page for additional resources, such as suggestions on how to schedule meetings with lawmakers, write letters to the editor, and reaching out via social media.